Lord ganesha is called with many names like Ganapati, Vigna Harta, Bappa, Vakratunda, and lots more, Its the birthday of Shree Ganesh, son of lord shiva. This festive season comes in September every year and many families of every caste, be it a Hindi or Muslim welcomes the lord in the form of IDOL worshiping for almost 10 days in total. At individual home the celebration and worship is done with the number of days they are convenient with, the minimum is of 1 and half day, Then is for 5 days and finally the 10th day of immersion. So to enjoy all the immersion fun saying ‘Ganapati Bappa Morya, Pudchya varshi Lovkar Ya’, which means we love you, you are the great and best and we will wait for your welcome again the next year, is on since 1 and half day. Lots of blissful is the environment inside home and around in society as many people brings in Ganesh idol for worship. Those few days the home inside and balcony etc are all decorated with lights and flowers and is a kind of different feeling and view one can experience. Occasion is celebrated by almost every hindu, Yet as said also by other castes and religion who believes in the divine blessings of lords of lord ganesh. To see and enjoy this festival at the best, Visit any marathi family as most rituals are done by Maharastrians, (i.e Marathi families) at its best. This festival is at highest celebrated compared to any other. 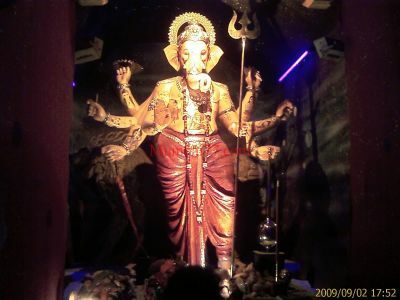 Hindu community peoples like Gujarati, Marathi and more keeps colorful lord Ganesh idol of all sizes and decorated themes for worship at there home and do Aarti (prayers) and other rituals twice daily. The Dia (Flame of fire) is kept ON with oil and ghee for 24 hours. Complete decoration like lighting, small temporary fold-able temple made up of THARMACOL is what are the main attractions apart from the beautiful idol. People keep idol for 1 and half day ganesh pooja, 5 days, 7 days and 10 days depending upon capabilities to serve and time they can devote to god. On the last day (Ganesh visarjan day) people chant “Ganpati bappa moriya, Pudcya varshi luvker ya”, which means dear ganesha we pray to you and request you to come again next year with lots of blessing and love. The crowd at Different places goes in LAKHS while visarjan (idol is finaly given to mother river) by devotees. People Comes in Lakhs together to enjoy the unique day of enjoyment where you can see idols of different heights and lengths like 9 feet, 25 feet, 50 feet and huge. Complete Road is blocked, with proper Mumbai police management. Lots of video cameras for security and also people get snaps/pictures/photos of Ganesh visarjan from chowpatty and other places for future memory. 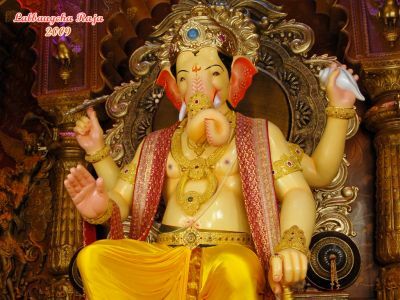 Sarvajani Ganesh Mandals is what is famous around Mumbai to enjoy this festival. Top Mandals around city, be big and fanous who attracts millions of devotees or be a small once in cooperative housing society of every other lanes of city, they are all very beautiful with individal themes and decorations style. The energy of this mandals day and night is to be seen for all this 10 days. Our leader Lokmanya Tilak started the very first mandal inside a small Chawl of Girgaon locations of Charni Road with the Aim of getting united and fight against British rules. It was 1893, a pure social cause of worship which since time was celebrated at peak and in 1953 the total number of Sarvajanik Ganesh Mandals were 1200 and now in 2013 is 11.460 in numbers which is really high. Sad part of this growing mandals is the city has lost the main motto of this festival and with adding years it is getting commercialized, Upon these 10 days of festival the news and media channels can be seen of detailing the Donations in Crores, Gold and Silver Offerings and other details like Insurance cover of this mandals etc. Yet what can we say and do, true devotees just comes, make offerings, pray to god for health, wealth and properity and move ahead, ignoring all the commercials, sponsors and political banners around. Getting to the attractions and fun part of such huge mandals is the Height of every Ganesh IDOL, Decoration and Message spread via all such themes and decoration and the huge rows lined up for hours to take a glimpse (Darshan) of the lord. Don’t forget to visit lalbaug location to get darshan of Biggest and tops the popular list of Ganesh Idol Lalbaugcha Raja, Since 1937 till date 2012. Not too far is GSB Seva Mandal’s pandal, famous for its richness. Every years they celebrate in the richer way. This year 2014 they insured for 50 Crores. If you have enough time to see all 10 days festive, try visiting these famous mandals (Group Organizers) at various locations of Mumbai. If you are at Virar, Far north suburb of Mumbai and last station on western railway route, You should visit Tembhipada, a small village on Agashi Road, just after Bolinj location. Every small village home has special decorations and theme. The celebration here is fun to see during evening hours. weekends here are crowded. Shree Siddhivinayak temple is already very famous in city, Yet during Ganapati festival try visiting on Tuesday to get lords blessings, if you are not allergic to crowd and can wait in queue for hours. Pull out about 3 to 4 hours to visit Khetwadi Galli’s which are famous since 1970’s for celebrating this festival big time. All 12 lanes (galli) have their unique huge idol up to 12 feet with various social and fun themes that plays for 5 to 10 minutes. Checkout the video section below or picture gallery link near image above. Dadar market near station in West, is yet another crowded yet fun place to visit, You can actually feel the celebration and decoration materials used. This market is cheapest cost market around Mumbai for decoration stuff for Ganesh festival and other similar like navratri. Still more to enjoy the festive fun ? Take a AC / NON AC bus ride from Mahim Depot in West till Suburb area like Borivali which covers major S V Road location that will show various mandals and lightings that makes you feel the real Mumbai spirit for ganesh festival celerbation all around. Lucky enough to stay back till 10th day of festival ? You must visit the Girgaon Chowpatty during visarjan. 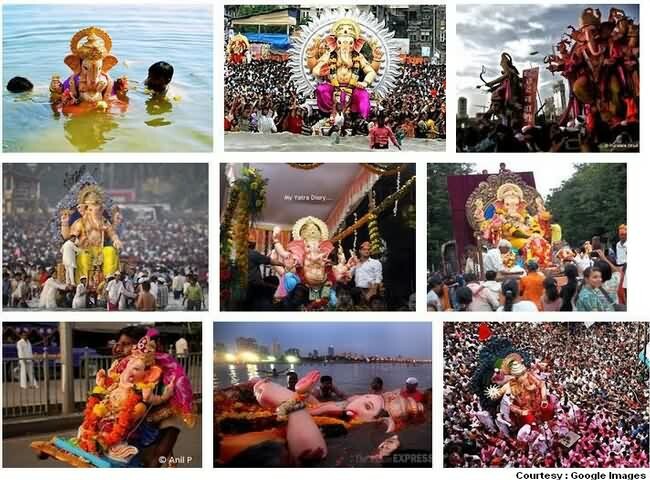 When All the Gaint idols around South Mumbai comes for last day celebration and lakhs of devotees fill up the beach. High security with CCTV and police in civil are all around in 10 meters distance to take care of Mandals and other visitors. Helicopters are always on run to check and keep watch of accidents in water. Like every previous years, 2013 has brought lots of excitement. One Good news being for the Visarjan Day (Last Day of Immersion) is that a huge Parking space will be available in South Mumbai’s famous Shivaji Park which will help those who comes from distance and within city specially to enjoy Bappa’s Visarjan. They can now park their vehicle at this Huge Historic park and have all the fun. BMC will also look for more options at private parking mill compounds gradually and hope the owners do cooperate well for same. Its just a matter of one Big Ganesha Day and as per news the counting of Ganesh mandals is 11,460 which is really huge and a tough challenge for our city Police. Hope the immersion of 2013 is full of blessings from our beloved God and be it also equally safe. More Details at Visarjan Video.